If you Google “the original photobomb,” the first search result is an image from a classic Seinfeld episode. In it, a charming family poses for a photo at the beach as Jason Alexander’s George Costanza, hovering awkwardly in the background, eyes them vindictively. It’s an image every Seinfeld fan knows from “The Slicer,” which aired 20 years ago today on November 13, 1997. In the seventh episode of Season 9, George tries to airbrush himself out of his boss Kruger’s (Daniel von Bargen) family photo before he recognizes George as the dope who threw his kids’ boombox in the ocean. But even if you never watched Seinfeld, you’d know the photo; it’s resurfaced on social media again and again in the years since the NBC sitcom ended, gaining new life as a meme, and collectively remembered as pop culture’s first photobomb. But that photo has additional significance to my family: My brother is in it. Yep, that’s my brother, the tall kid on the right. Whenever I meet a Seinfeld fan, I brag a little (who wouldn’t?) and tell them how my mom was a boom operator on the sitcom for nine years, show off a photo of me on Jerry Seinfeld’s couch, then pull up the beach shot to reveal that my brother, Travis Wesley, was part of The Boombox Incident. 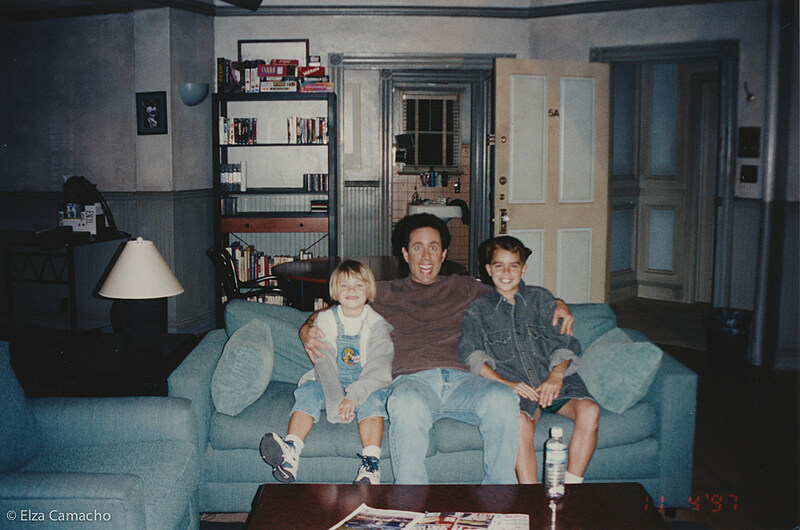 My brother and I would frequently hang out on the CBS Radford set as kids, so often that Jerry Seinfeld once gave him a ride in his brand new Porsche Boxster (you can see the proof here and here). In honor of the 20th anniversary of “The Slicer,” I interviewed my brother about being in the iconic Seinfeld episode, and what it was like to be screamed at by Jason Alexander, a typical experience for any 12-year-old. So I was 6 at the time. I remember being on set and watching them rehearse Elaine’s dream sequence. But I don’t remember the specifics. How did you ended up in the episode? I think it was because I was always on the set hanging around with the camera guys and gaffers. There was a production meeting and the 1st A.D., Randy Carter, said, “Why don’t we use Travis for this shot?” Because they needed two kids and I’d already been there. That’s when Mom said, “Hey, they want you to be in the episode.” She took me out of school for a day and they actually had to get a school teacher to be with me on set. And at the time, I didn’t know what the episode was going to be, I just new it was going to be something with Jason. I remember being amazed that they wanted to include me. I was like, “This is cool, but I’m not really sure what to do.” I’ve seen other people act, but I never did child acting. I came in that day and they had the backdrop set up and some fake sand. They just said, “This is going to be a beach scene.” They introduced everyone, Daniel von Bargen who played Kruger, Billy Ford, the best boy electric on the show, his son Brendon was the other kid, and the woman who played our mom. I was in my usual basketball shoes and some swim trunks they told me to bring. The photographer arranged us and it was kinda weird – I’m posing for a family photo with people I’ve just met. This is like my new fake mom and my new fake dad and this other kid I never met before is my brother. And then you have the added weirdness of Jason Alexander in character, who, just seeing him in person you just want to laugh. Same with Michael Richards, you see them and you’re about to crack up, especially as a 12 year old kid. So I have this smile on my face the whole time because Jason is fully in character as the grumpy Costanza. It's so funny – in the photo mom took, he’s in character with his arms crossed and you’re standing there with this big smile on your face. Yeah he’s there with his shirt off. And this was before I knew about “The Gymnast” episode from an earlier season where he takes his shirt off when he goes to the bathroom. So the photographer is there taking pictures, but we couldn’t see it because you know it was film at the time. And the episode ended up cutting to the picture several times. At the time I thought it would just be a prop on the desk. I had no idea it’d be such a huge part of the plot, but they cut back to it about five times. Then you also shot the scene where Jason is yelling at the two of you. Yeah, the next thing we shot was The Boombox Incident and I never forgot that. They were describing, “Okay, you and your brother are here with your family and George is going to run up to you and start screaming. He’s going to take your boombox and throw it in the ocean. And he’s going to be super pissed off and angry, but you’re going to have to try really hard not to laugh.” Even though the shot was from behind us, if you look at it you can see us kind of trembling but we’re just trying to hold in our laughter. Jason did it a few times, and each time we were dying laughing. Every time I see that shot in the episode now, I just think how absurd that is, and how amazing of an actor he really is. Watching the episode later on when I started to understand the adult humor, and Jerry’s dating plot, it was even better. As a kid you see Jason’s physical humor in one way, and when you get older you see it in a different context. It was pretty neat to experience such a unique scene from a kid’s perspective, and later see it as an adult and still laugh about it. I mean it’s called “The Slicer,” but to me The Boombox Incident is the standout of the episode. So you shot it in October. The episode aired four weeks later. Did you tell people about it at school? Did they watch it and recognize you? I remember going back to school after and telling some of my friends about it. I don’t think they believed me, since the episode didn’t air for a while. But when it did everybody was like, “Oh yeah! That’s the kid in the picture on the bottom right!” It’s just kind of surreal. Like, did I really just stand on a set with Jason Alexander yelling in my face, and the next morning I’m in 8th grade English class? It’s wild how iconic the photo has become. I always see it pop up on Instagram accounts, like F–k Jerry, or Reddit, and send you screenshots of it. It’s pretty much the original photobomb. Yeah, or it’ll be thrown into some kind of meme. It’s the photobomb that everybody knows, even if you didn’t watch the show. I’ve shown it to people when I’ve traveled to other countries. When I was in Thailand a couple years ago, I showed it to some tourists in my hostel and all these Canadians were freaking out like, “This is the kid!” I showed them a couple photos of me with Jerry on set and they were like, “We’ve gotta get a selfie!” It was cool because people know the episode and that they recognize it, even 20 years later. And then my whole life sort of revolved around photography after that, and I think it was mainly due to me being on that set. I was hanging with all the camera guys, and they’d show me all the gear. It was like hanging out with your uncle or something. 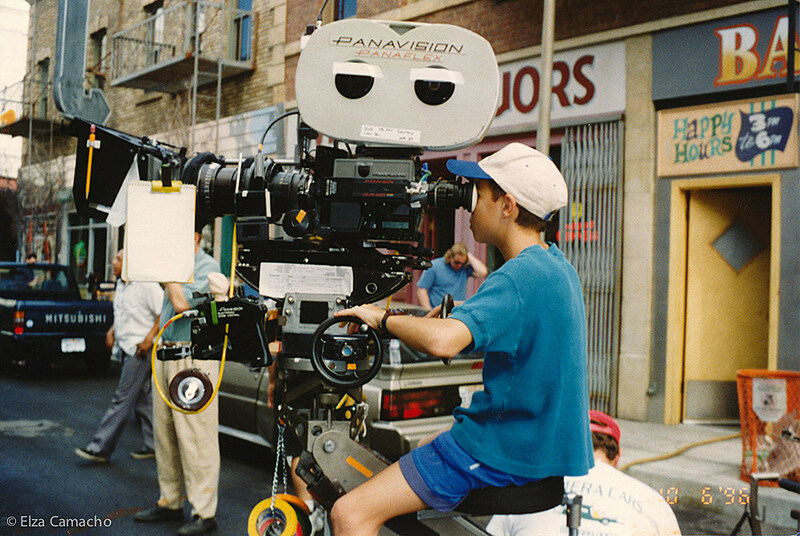 For me, it was the ultimate gear – a Panavision camera on a dolly. I’d get to sit on the camera and play with the real stuff that’s reserved for the James Camerons and the Scorseses. I love the photos of you sitting on cameras on the backlot. And now you’re a photographer with dozens of cameras! Yeah, on my website there’s one of me on the Panavision camera on New York Street. That was one of the most amazing things, to touch this cinematic gear, to look through the viewfinder, see them load the film, take it in the dark room and transfer it over. Even though mom worked in sound, I gravitated so much more towards camera stuff. When I really think about it, Seinfeld is probably what got me into photography and film, and why I became so obsessed with watching movies. Being on that set was one of the coolest things I’ve been a part of. Watch “The Slicer” on Hulu.